The original Happy Chef restaurant opened in Mankato, MN in 1963, and it is still open, even though the original owner is trying to find a new buyer. When I was a kid, we would stop here for breakfast every time we made the drive to see the relatives in Fort Dodge, Iowa. Traveling down US Hwy 169 once again, I had to swing in, for old times sake. Good times, and very good memories. 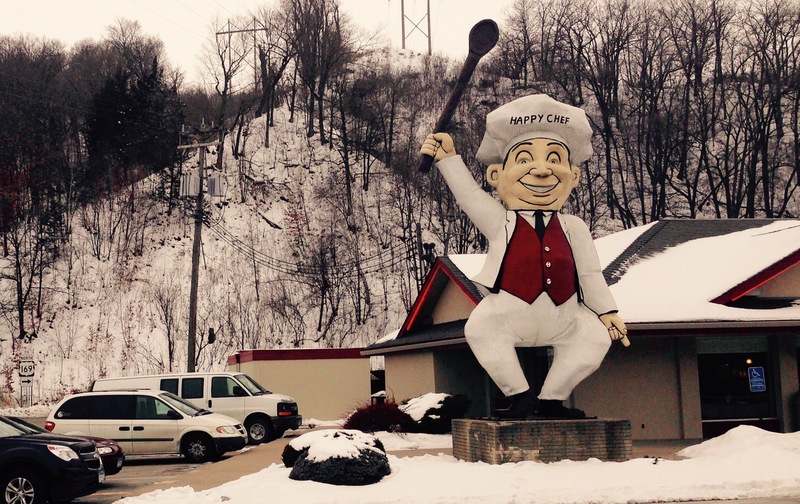 At The Happy Chef’s peak, there were 80 of these restaurants throughout the midwest, most of them with the giant, smiling Chef outside to greet diners. Today, the original in Mankato is the last one. This entry was posted on Thursday, January 21st, 2016 at 10:37 AM	and tagged with dining, driving, history, Minnesota, photo and posted in travel. You can follow any responses to this entry through the RSS 2.0 feed.